Pumps in cast-iron with single-channel impeller. 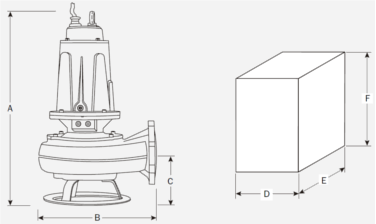 This kind of impeller grants a good free passage for the solid and fibrous parts contained into the water but it gives also an higher flow and head than the "vortex" impeller. These models with an heavy duty construction, double mechanical seals and 1450 rpm motor can be used to pump heavy sewage water. 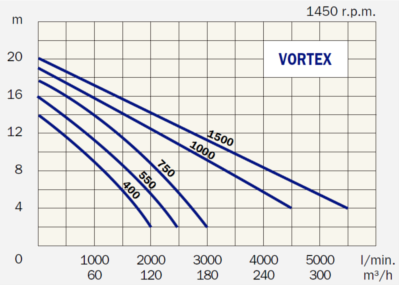 The VORTEX 550 and VORTEX 750 are usually installed into big block of flats' cellars to drain the dirty water or in public sewage water nets. These models are also often used in farms to pump out the manure of the stables, in industrial plants, in sewage water treatment plants, in sludges treatment plants, etc. These models cannot be used to pump water containing stones. Electric board Professional electric board model F1-5.5-3 or F1-7.5-3. This electric board provides a manual reset thermal protection to protect the motor of the pump and it permits the connection of a float-switch. Moreover this electric board has a control of lack or invertion of phases. The connection of the three-phase pump to an electric board is mandatory.